It is difficult to conceive many human activities that do not in some way depend on affordable, reliable energy. Whether it is providing fuel for our vehicles, electricity and heat for our homes, or energy for the production and transportation of the products we use daily, almost everything we do depends on a constant supply of energy. Inexpensive energy has helped our society create wealth and, as an energy exporting state, is a cornerstone of our economy. The United States is the world's second largest consumer of energy, and Alaska as a state has the second highest per capita energy use in the nation at 946 Mmbtu per person.1 This is almost three times higher than the national average of 327 Mmbtus, and is in part due to our climate, with long cold winters throughout most of the state requiring more energy for heating homes2 However, our geographic location and oil and gas industry also contribute significantly. For example, almost 32 million barrels of jet fuel were used in 2006. Jet fuel constitutes 43% of total energy end-use in Alaska, however a large portion is used for international flights and is not actually consumed in-state. An additional 484 Mmbtu can be attributed to energy used for oil and gas production in 2006, and while this was energy consumed in-state, a vast majority of the product was shipped out of state as crude oil exports. Alaska is also home to tremendous untapped or underutilized energy resources, including some of the highest concentrations of fossil and renewable energy resources on earth. In addition to the well-known oil and natural gas resources on the North Slope and in Cook Inlet, Alaska’s proven coal reserves represent the 4th largest fossil energy resource in the world. Alaska also has significant undeveloped geothermal resources in the Aleutian Island volcanic arc, abundant untapped hydropower, wind, and biomass resources, and the majority of the tidal and wave power potential in the United States. Using data on the consumption of energy from the U.S. Energy Information Administration (EIA), we can track the amount of energy used in Alaska since statehood. These estimates of consumption from the EIA also include energy used during oil and gas extraction processes, and jet fuel from international air travel. The graph below shows the gross consumption of energy in Alaska from 1960 through 2008. Oil and gas production began in Cook Inlet during the late 1960s, and by the early 1980s natural gas was the predominant source of energy used in Alaska. When oil and gas production began on the North Slope in the late 1970s, natural gas consumption by industrial users increased dramatically because it was used to power North Slope operations. All other fuels, including diesel, motor gasoline, jet fuel, and coal, have contributed relatively stable shares of total energy consumption per capita in the state. Administration. 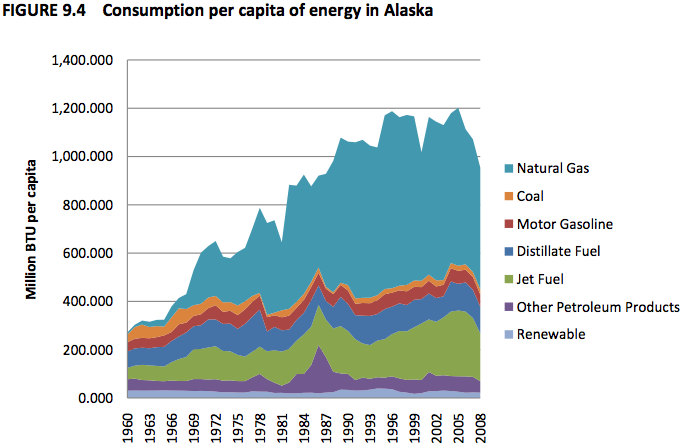 From ISER's "Alaska Energy Statistics 1960-2008." Goldsmith, Scott. "Alaska's Petroleum Industry: Transformative, But is it Sustainable?" Institute of Social and Economic Research (ISER), University of Alaska Anchorage. April 2011. http://www.iser.uaa.alaska.edu/presentations/FV3_of_Northrim_Presentation_for_Frbks-Anch-Juneau_April_2011_v2.pdf. Accessed: 2 Aug. 2011. This presentation has two stated purposes: "First to demonstrate the transformative impact of petroleum on the Alaska economy, and second to answer this question—Is petroleum an industry in decline in Alaska, or can it continue to sustain the prosperity we have come to enjoy and expect, for another 50 years or more?" 2. U.S. Energy Information Administration. "State Energy Profiles: Alaska." http://www.eia.gov/state/state-energy-rankings.cfm?keyid=60&orderid=1 (figures from 2008). Accessed: 7 July 2011.